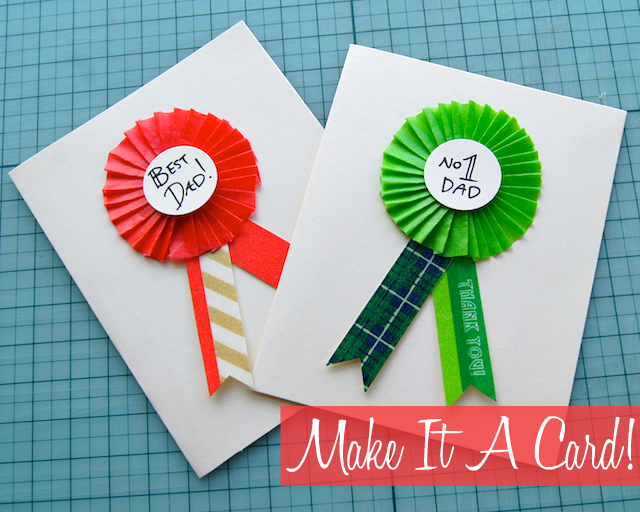 This Father's Day, why not make Dad a card? We love the idea of creating one of our Washi Tape Award Ribbons and sticking it to the front of a blank card. Let Dad know he's number one or the best or... fill in blank here with your best Dad compliment! Best part? Dad can easily peel the ribbon off the front of the card and wear it with pride all day long! Because when you're the best of the best, you want everyone to know it, right? This is such a cute idea! I think I might have to make one of these for my hubby since this year will be his first fathers day ...and I have a bunch of awesome Washi tape that needs to be put to good use! Hope you do! And Happy 1st Father's Day to your hubby - how exciting! You know, I thought this was cute even before you mentioned peeling off the ribbon to wear it, but now I think it's a downright fantastic idea! I'm so glad I found this blog! Thanks Paulette. That's so sweet! !